This five-week class is for puppies from nine weeks to six months. Classes are held on Tuesday evenings from 6:00-7:00 pm. Puppy does not attend the first class. Space is limited to 15 dogs and the fee is $55.00. Classes are held on Tuesday evenings from 7:15-8:15 pm for six weeks starting September 5th – October 10th. The dog does not attend the first class. Space is limited to 15 dogs with a fee of $65.00. Dogs attending this class must have completed the Dog Obedience course prior to enrolling in this class. Classes are held on Tuesday evenings from for six weeks. The dog attends all classes. Space is limited to 15 dogs. This one is for man’s (and woman’s) best friend! 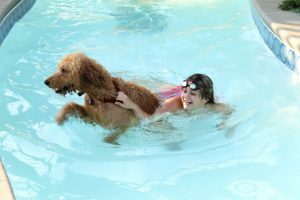 Last year there were over 100+ excited dogs of all types and sizes that attended our annual dog swim. Some even wore their favorite swimming attire! This event is held every year to close out the aquatic season so be sure to join us this year!